Here are some small things you can do when it comes to saving water. As the climate warms, drought is becoming more and more common. Parts of Texas have been in drought conditions for nearly a decade, for example. As this becomes more and more common, conserving water is an important measure to take. While many people know that doing things like taking long showers or wasting water on ultimately useless grassy lawns can waste water, those are actually not the main culprits. We waste a lot of water due to inefficient water management systems that do not handle water correctly. Here are some small things you can do to conserve water. Did you know that if your toilet tank is leaking, you might be wasting up to 100 gallons of water a day? You can see if this is happening with a simple test. Drop a few drops of food coloring or put a dye tablet into your toilet tank and flush. If the color appears in your bowl when you flush your tank is leaking. Depending on its age, make, and model, this may be an easy fix or may require replacement. This does not even have to be a drastic change. 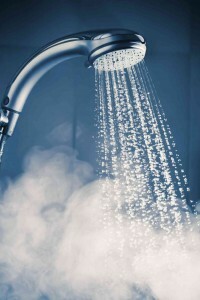 Taking just two minutes off of your shower can save over 1000 gallons of water a year. This little change can make a big impact over the course of a decade or a lifetime. Also, as long as your soaps and hair products are plant safe, you can collect extra shower water in a bucket and use it to care for your plants. Many people think that hand washing dishes is more efficient and less expensive than running the dishwasher, but this is actually not true. In fact, hand washing dishes can use up to 27 gallons of water. A new Energy Star-rated dishwasher uses a fraction of that. It needs roughly 3 gallons of water to do the same job. If you have an at home pool, keep it covered when you aren’t using it. Especially in the summer heat, vast amounts of water can evaporate, leading to you constantly refilling your pool. Avoid this by keeping your pool covered between uses. This entry was posted on Friday, August 4th, 2017 at 3:41 pm. Both comments and pings are currently closed.